For the second year in a row, Higgins has won the Supreme Award at the New Zealand Contractors Federation Awards 2014 (Nelson/Marlborough). 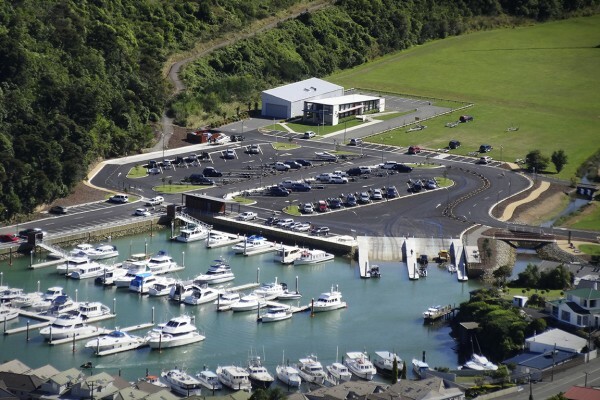 The team involved won for their work on the Picton marina launching ramp, Jetty 10, landside works and carpark. Alongside the Supreme Award, the project also won the Projects Over 1.5M award and was nominated for the national awards. The contract involved the demolition and removal of the existing infrastructure, building a 860m2 boat ramp, 83m seawall, boardwalks, viewing platforms and 10,000m2 of new asphalt pavement. It also called for excavation of a new marina basin, increasing the number of berths from 106 to 121 and redeveloping a stream. A pedestrian precast concrete bridge was constructed to cross this stream and the Memorial Stone Entrance was altered with supreme care due to its high cultural significance. The team are now putting their award winning skills in Picton on the Lagoon Road freight marshalling facility. At Higgins our doors are always open.